Novell® ZENworks® Endpoint Security Management provides complete, centralized security management for all endpoints in the enterprise. Because ZENworks Endpoint Security Management applies security at the most vulnerable point, the endpoint, all security settings are applied and enforced regardless of whether the user is connecting to the network directly, dialing in remotely, or even not connecting to corporate infrastructure at all. This is critical to not only protect the data within the corporate perimeter, but also to protect the critical data that resides on the endpoint device itself. ZENworks Endpoint Security Management automatically adjusts security settings and user permissions based on the current network environment characteristics. A sophisticated engine is used to determine the user's location and automatically adjusts firewall settings and permissions for applications, adapters, hardware, etc. Security is enforced through the creation and distribution of ZENworks Endpoint Security Management security policies. Each location (Work, Home, Alternate, Airport, etc.) listed in a security policy is assigned to a network environment (or multiple network environments). A location determines which hardware is available and the degree of firewall settings that are activated within the network environment. The firewall settings determine which networking ports, access control lists (ACLs), and applications are accessible/required. Various integrity checks and scripts can be run at location change to ensure that all required security software is up to date and running. In securing mobile devices, ZENworks Endpoint Security Management is superior to typical personal firewall technologies, which operate only in the application layer or as a firewall-hook driver. ZENworks Endpoint Security Management client security is integrated into the Network Driver Interface Specification (NDIS) driver for each network interface card (NIC), providing security protection from the moment traffic enters the computer. 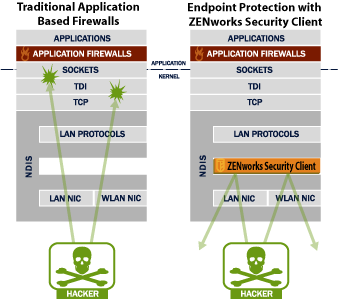 Differences between ZENworks Endpoint Security Management and application-layer firewalls and filter drivers are illustrated in Figure 1-1, Effectiveness of NDIS-Layer Firewall. Security decisions and system performance are optimized when security implementations operate at the lowest appropriate layer of the protocol stack. With the ZENworks Security Management Endpoint Security Client, unsolicited traffic is dropped at the lowest levels of the NDIS driver stack by means of Adaptive Port Blocking (stateful packet inspection) technology. This approach protects against protocol-based attacks, including unauthorized port scans, SYN Flood, NetBIOS, and DDOS attacks.